Chess requires intensive forethought. Players must anticipate several steps ahead, and weigh multiple complex scenarios before completing each move. The algorithms involved are so complex that they have been a measuring stone for artificial intelligence over the years. Additionally, the game is a (not so veiled) metaphor for battle. King versus King. Black versus white. Good versus evil. At the base level, me versus you. There are near endless designs for the veritable gameboard, from elegant to amusing to cultural to flamboyant to stark. Yoko Ono’s 1966 “Play it by Trust” set turns traditional chess on its end, in ways both computational and philosophical, with a simple twist. In it, both sides play white. Are white. Are indistinguishable from one another. As are the squares on the checkerboard. 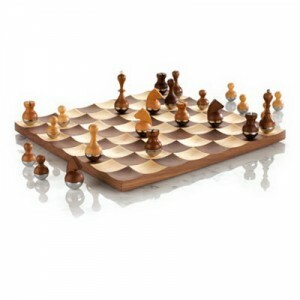 With this set, the mental calculation necessary to play a good game includes the additional layer of remembering which pieces are yours, and which belong to your opponent. who is your own self. How sustainable is battle against an enemy that looks just like you? 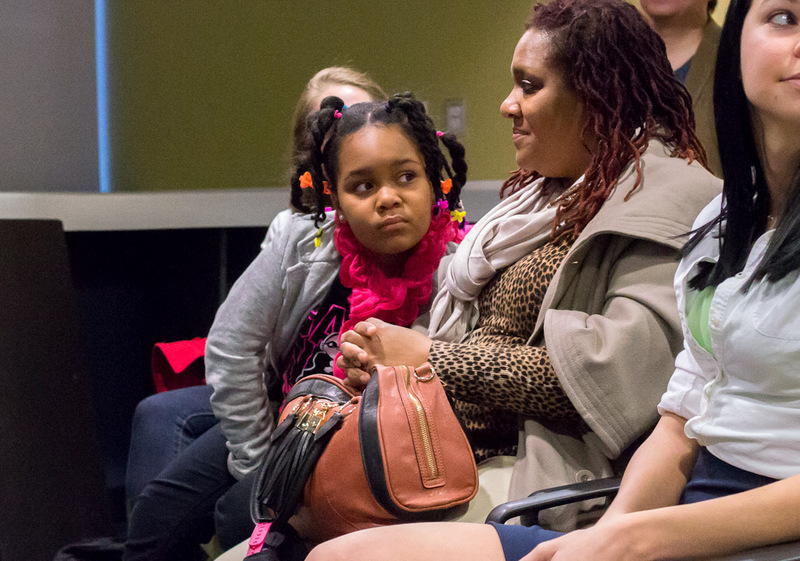 How relatively easy is war against a culture that does not look like you? With not more than a humble color change, this design becomes provocative art. Smooth wood. Primary colors. Fundamental shapes. Meet Naef play objects. 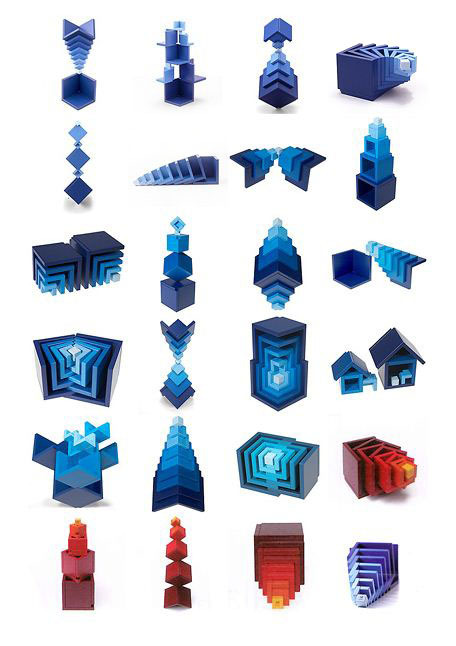 The beauty of these Swiss-made toys lies in their relative simplicity: interlocking shapes that can be rearranged and stacked into infinite patterns. Seemingly basic pieces allow children to explore the physics and visual cues of our world, having fun as they discover new relationships of shape and color. The elementary designs leave room for the imagination to roam, uninhibited by a connected brand or cartoon story. Adults hands will be itching to play, too. The array of available configurations sparks thoughts of malleable table art. Indeed, the price tag on many of the items suggests more artwork than plaything, with averages between $150 – $300 per set. Famous Swiss workmanship does go into each piece: most are handcrafted and quality-inspected to within a millimeter. 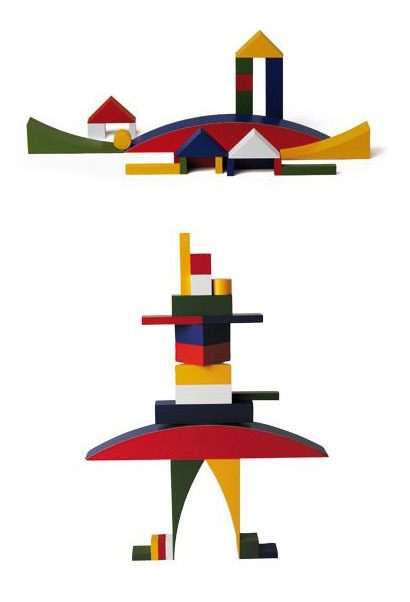 Also worth noting is that each knickknack was created by a specific designer, including authorized replicas by original Bauhaus members. There’s even an annual contest held to find creative new arrangements for certain sets, held in Japan, where Naef has had a strong presence for decades. In 2005 Naef USA was launched in Winchester, Virginia and is going strong. Perhaps we’ll see greater spread of these decidedly un-quotidian blocks here in the near future. Who said chess had to be staid? Designer Adin Mumma‘s surprisingly elegant Wobble Chess Set adds a touch of whimsy to the serious game. The maple and walnut pieces are finished with rounded chrome zinc bottoms that sway when placed in the concave spots on the polished wooden board. 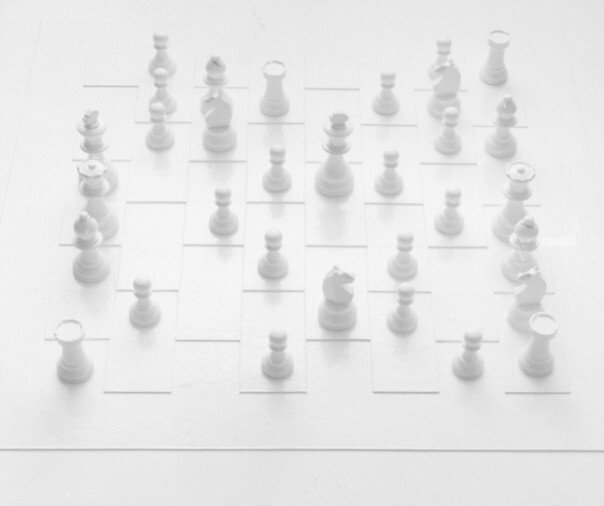 Unusual chess sets abound, from one etched from Waterford Crystal to LEGO playing pieces to Givan’s custom-constructed vertical board, found in high-profile venues such as Jay-Z’s 4040 Clubs. In adding quivering motion to this refined pastime, Mumma has created something new. Thoughts of Lewis Carroll cannot be far behind.